Hello everyone! Today I wanted to share some of my top beauty related tips with you all. These are some handy tips I’ve picked up over the years, and you may find helpful! I find these kind of posts interesting to read myself, and a great way to pick up new tips and tricks you may not already know. Always leave time for your skincare products to sink into your skin. It’s going to give your skin time to benefit from the products, as well as preventing your makeup sliding everywhere. I try to wait 15-20 minutes, but understandably not everyone has time to wait that long but even if its just 5 minutes whilst you do your hair, it will help! Using the same shade you used to contour the face to define the crease on your eyes is going to really help bring your face together. The same goes for highlighter, use the same shade on your inner corner that you’ve used on your cheekbones. 4. Too much powder? Fixing sprays will save you! I can’t be without some kind of fixing spray. I’ve tried my fair share over the years, and the Mario Badsecu Facial Spray, MAC Fix+ and Urban Decay All Nighter are my top picks. Adding a few sprays after applying your makeup will really help to get rid of that dreaded overly powdered look, as well as freshen the face and help the makeup to blend into the skin, giving a more natural look. 5. 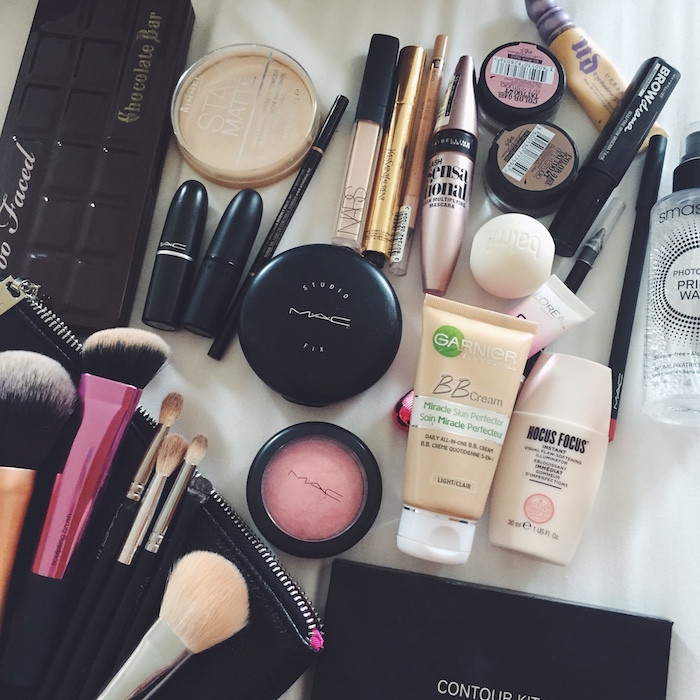 Sponges are your makeup BFF! I never used to be a big fan of sponges, that was until the Beauty Blender came into my life! Using the sponge damp is going to help blend products into the skin seamlessly. I usually apply my foundation with a Sigma F80, then go over with the Beauty Blender to make sure its really blended into the skin. I then use it to apply my under eye concealer, and it works better than any brush I’ve tried. The MAC All Blending Sponge is also great, and I own a few of them. Pumping your mascara is going to add air into the tube and make it dry out faster. Also if black mascara is too dark or bold for you, give a brown mascara a try. It’s going to give a more natural look, or you can skip mascara all together and get your lashes tinted. It may sound scary to some, but tape can be a real saviour! If I want a really precise line then I’ll apply a little bit of tape under where I want my wing to give me a guide to follow with eye shadow or liner. So the tape isn’t harsh on my skin, I always stick it down on the back of my hand then on my face so it isn’t as sticky. It’s also great at catching excess fallout. If you’ve used glitter then wrap a small piece of tape around your finger and use it to pick up any that’s fallen halfway down your face, preventing you from looking like you cry glitter! Back when I wasn’t so clued up on makeup and skincare, I used to think that the higher the price the better it will be. In some cases this can be true, like with ingredients, but it can often be a matter of paying for the brand. I say always do research, read others reviews- especially if it’s something super costly! 9. Lip liners are a must! Lip liners are an absolute must have for me. It’s going to help create a smooth even edge, give something for the lipstick to stick to and help it to last longer. My favourite lip liners are from MAC, but Essence also do some great liners, and they’re super affordable. You can also go around your lips with concealer and an angled brush after applying liner and lipstick to really neaten up the edges. Never repeat NEVER drag your powder brush over the skin. Always lightly tap the brush into the skin. Pressing the product into the skin is going to help your makeup last longer, and help give a more flawless look. Dragging the brush over the skin can move the foundation and concealer around the skin. Hope some of these tips have been helpful to you. If you have anymore, leave them in the comments below!